1. Adjoint estimation: low or high order? Adjoint methods have been systematically associated to the optimal control design  and their applications to aerodynamics [1, 4]. During the last decades, several works were oriented to develop a robust control theory based on the concepts of observability, optimality and controllability for linear and non-linear equations and systems of equations [2, 10, 11, 12]. where is a time-independent velocity field of propagation. This problem can be easily addressed by simply solving the transport equation backwards in time because of the time reversibility of the model. But such a simple approach fails as soon as the model involves nonlinearities (leading to shock discontinuities) or diffusive terms, making the system time-irreversible. where is the adjoint variable. In order to achieve a good match with the continuous solutions, high order numerical schemes need to be used for the forward state equation (1). Here we shall use a second order scheme. Our main objective is to test the convenience of using the same order of accuracy when solving the adjoint equation or, by the contrary, to employ a low order one. When implementing the gradient descent iterations, the numerical scheme employed for solving the adjoint equation determines the direction of descent. Hence, different solvers for the adjoint system provide different results that can be compared in terms of accuracy and efficiency. A gradient-adjoint iterative method is based on iterating a loop where the equation of state (flow equation) is solved in a forward sense while the adjoint equation, which is of hyperbolic nature as well, is solved backwards in time (see Figure 1). The adequate resolution of this loop is the main question addressed in this work, paying attention not only to accuracy but also to reducing its computational complexity. One could expect that the choice of high order numerical methods to solve both the equation of state and the adjoint one should provide the best results in terms of accuracy, at the prize of a high computational cost. But this is not always true and it is possible to relax the necessity of using the same order of accuracy for the resolution of the adjoint equation, not only reducing considerably the computational time needed by the complete loop but also achieving the same order of accuracy on the approximation of the inverse design, which is our ultimate goal. Obviously, the solution exists and it is unique and can be determined by means of the method of characteristics provided is smooth enough (say, ). Thus, for all initial data there exists an unique solution in the class . Let us consider the inverse design problem: Given a target function at , to determine the initial condition such that . where is the boundary and is the outward normal direction to the surface respectively. This equation measures the sensitivity of the solution to changes in the initial condition. It is worth mentioning that the adjoint equation is solved backwards in time (from to ). In fact, system (15) is well-posed if and only if the original system is well posed in the forward sense. with is the number of edges of each cell ( is for triangular grids) with neighbouring cells . Figure 2 clarifies the meaning of each variable. 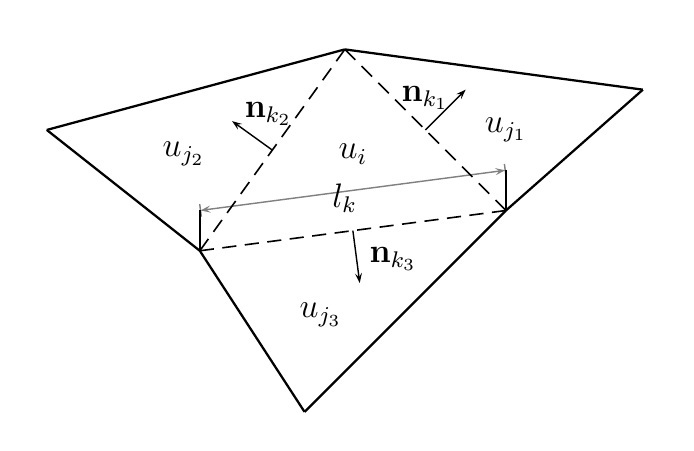 In this work two numerical schemes are proposed: a first order upwind (FOU) scheme and a second order upwind (SOU) scheme based on MUSCL-Hancock approach. The details of the implementation can be found in  and [6, 9] respectively. The use of a SOU scheme for the flow equation (forward) is mandatory in order to achieve the best accuracy since the FOU scheme is unable to capture the detail for the equation of state when trying to reach the target function. The issue of using one or another approach for solving the adjoint equation and, consequently, the gradient direction approach, is worth analysing. This allows us to formulate the problem of inverse design. Given the exact value of the solution at time , i.e. giving (21) as a target function at , we aim to recover by a computational version of the gradient-adjoint methodology described above, an accurate and efficient approximation of the initial datum (19). In our numerical experiments we take the values and . The exact initial condition and the exact target are shown in Figure 3 (left and right respectively). As can be seen, the target presents a vortex-type profile, due to the heterogeneous geometry of the velocity field. Our goal is to build a numerical method capable of predicting accurately and efficiently an approximation of (19) out of the target (21) by means of a numerical version of the optimisation algorithm above. The domain is discretized in 39998 unstructured triangles using Triangle  in a uniform Delaunay mesh. The initial condition for the first iteration is . Both the forward and backward resolution are parallelized with OPENMP in 4 cores. The maximum number of iterations for the gradient method is set to 75, a constant step is selected and the Courant number is set to . To descend below when halving the step size trying to achieve convergence. The numerical results are shown in Figures 4, 5 and 6 for the target , initial condition and adjoint respectively at the last iteration of the gradient method. On the left side the approach is displayed while the resolution is illustrated on the right side. In order to complete the qualitative results, the error computed as the difference between the exact and the numerical approximation is displayed in Figures 7 and 8 for the target and the initial datum . Table 1 condenses this information as well as the number of iterations and the CPU time for each proposed scheme. For the sake of clarity and for each comparison, the best results are highlighted in bold font. Note that the number of iterations for the approach does not reach the maximum number of iterations set at the beginning of the inverse design process because at iteration 45, the functional is not able to diminish its value to the next iteration due to the deterioration of the initial condition by the high frequencies.